12/28/18 - Where Can I Ride My E-Bike? Worth Noting: Both the Cleveland Lakefront & Emerald NecklaceTrails consist of significant road riding segments. A key difference is: The Lakefront Trail utilizes urban city streets in the heart of the city, while the Emerald Necklace uses more bike-friendly parkway roads in the suburbs. Though the bracelet was never developed, the concept has been resurrected and renamed in recent times. Learn more about the 29-mile City Loop Trail concept. To learn more about the Cleveland Bikeway Master Plan, as well as trails that are currently in the construction and planning stages, visit the Cleveland Cycling information page. The Bike Rack, located at 2148 East 4th Street, is the area's first full service bicycle parking and commuter center. And any major city worth its salt has a bike share system. Cleveland offers up UHBikes to fill that need. Bike Cleveland is the voice for area cyclists for all things bicycle-related -- education, active living, commuting promotion, etc. And naturally, their voice is often heard where Cleveland-area transportation infrastructure is concerned. Their work has spawned similar efforts in neighboring suburbs, such as with Bike Euclid, which became a chapter of Bike Cleveland in 2017. As the Ohio & Erie Towpath draws closer to Lake Erie, it will bring trail travelers from as far as the riverfront in Cincinnati via the Ohio-to-Erie Trail. 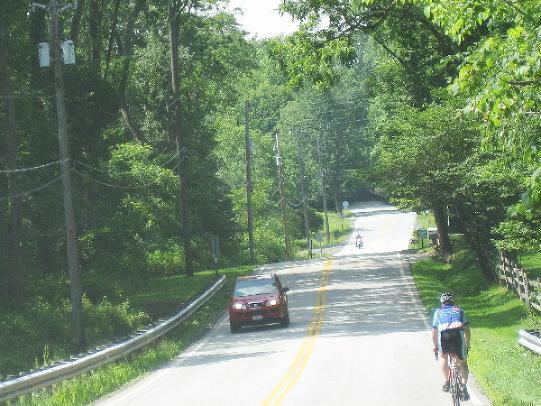 That destination by the lake is also shared by another long trail, the Ohio & Erie Towpath, which will bring yet more riders from Summit, Stark and Tuscarawas Counties as well. So, what happens when all these riders are funneled into Cleveland when the towpath is completed in 2020? If Cleveland plays its cards right, riders may be encouraged to stick around and explore further. But of course that requires trail connections, amenities, as well as related infrastructure for bicyclists. It is indeed a golden opportunity for city planners. The only question is -- will they take advantage? In the meantime, trail connections and extensions abound in the form of rail-trails, towpath and park trails. So if you'd like to ride here, there's no reason to wait for future development. Many trail miles and connections are already in place. Such as the connection to the nearby Bike-Hike Trail by way of the Emerald Necklace or Towpath Trails. If cycling diversity is your cup of tea, then you could say the Cleveland area offers a fine blend. There are parkway roads within the Emerald Necklace that are bike friendly, multi-use trails that twist, turn and climb, flat smooth trails and even paved towpath. There's even a velodrome! Throw in some dedicated bike lanes and the Cuyahoga Valley National Park just to the south, and you have a wide range of riding options!